I'll be honest in saying that I did not buy this backpack. I had the opportunity to review it for MindShift Gear / Think Tank Photo and I was happy to do so. That said, I'm including my honest opinions on it without restraint. If there are areas where it did poorly, I don’t hesitate to say so. 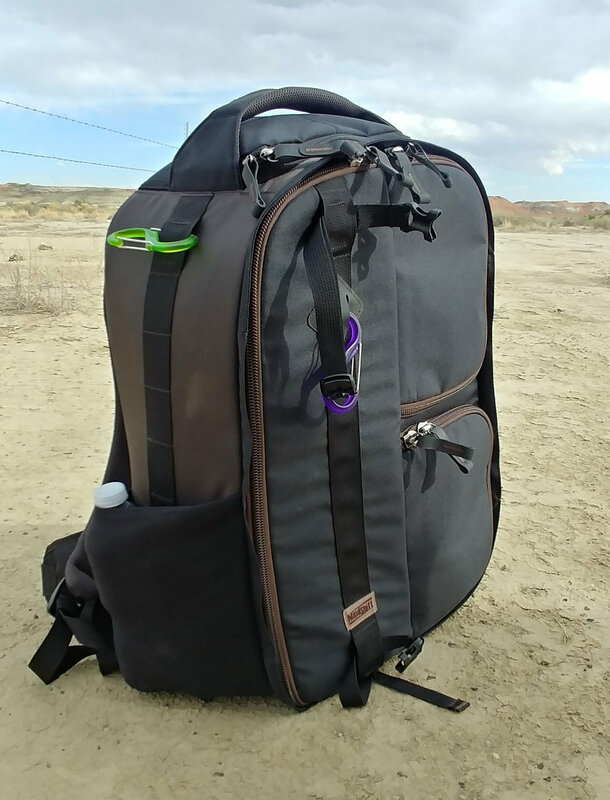 To test the backpack, I took it out numerous times - during in-field training sessions in Arches & Canyonlands National Parks and shooting on my own in several locations including the Bisti Badlands of New Mexico. In this review, you'll see images only from my direct experience using the backpack. Description: With plenty of space, the Moose Peterson MP-3 lets you carry a lot of gear and it keeps it all well organized. It's a well-designed backpack for small to medium sized photo adventures. To be useful for my purposes, I need a backpack to carry a lot of gear and it has to be comfortable. Beyond that, I like a pack that's well designed for easy access to my gear - including both photo gear and items to stay warm. Finally, my pack should hold all my gear without feeling too big & bulky or like I have to squeeze items in to get them to fit. One thing I really liked was the velcro straps that hold the camera body in-place. This is the first time I’ve seen such a secure approach to holding a camera body in place and again, I was impressed. Don’t worry about this being a hassle if you don’t want to use these straps because they’re easy to use or not use with ease. I also really liked how the Moose Peterson MP-3 secured my tripod. I’ve seen a few different approaches to doing this and I think I like hanging it on the back as my favorite - which this pack handles with ease. This made it flexible for my needs and very secure. Zippers are all well positioned and easy to open. The innovative design of the camera storage compartments is in my view the biggest strength of the Moose Peterson line of backpacks. They have separate compartments that make it easy to organize your gear in a logical way and to get to it when you need it. Thanks to is innovative design, I’ve had numerous times where I’ve had to access gear from inside my pack and was able to do so without even removing the tripod - something most packs cannot do. Beyond the compartments, the doors use an innovative design that works especially well. Of course, they’re easy to open but they also automatically close and they stay closed on their own - which protects your gear from dust and moisture better than any bag I’ve seen before this. Even though the Moose Peterson MP-3 V2.0 holds so much gear, I would consider it as a day pack - meaning it's good for going out for the day with your photo gear. The lack of compression straps and room for extra supplies means it wouldn't be the best choice for overnights. In-fact, I find it a bit limited for carrying non-photography gear. If I were looking at an overnight or a multi-day adventure, I would likely lean toward a different pack with some overnight features. The pack has some room for non-photography items in the outside pockets but space is a bit limited so it'll encourage you to pack smart and to use it for adventures meant for a few hours. If you wanted any more than one layer, I’d recommend that you either sacrifice one or more of the compartments inside meant for photo gear for clothes/supplies or look at different pack. 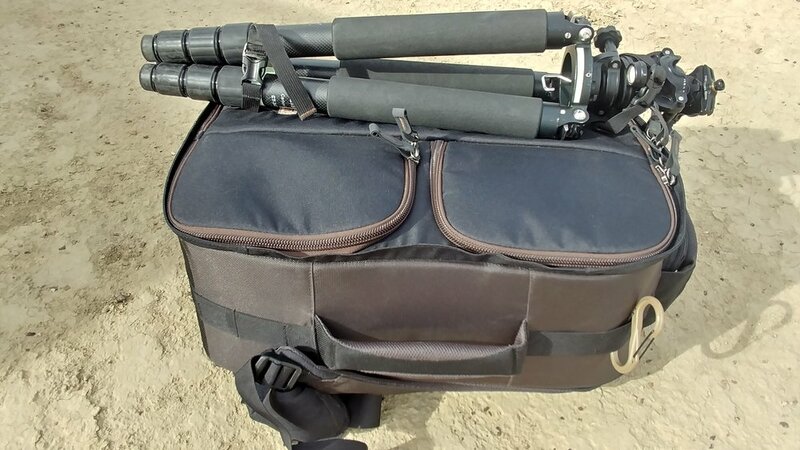 I especially liked the big side pockets that work well for small tripods, water bottles, or anything else you can think of. For items stored in the side pockets, access is great! While the Moose Peterson MP-3 V2.0 doesn’t provide a lot of options for storage of non-photography items, you could store some in the areas meant for photo gear. If you do this, you could use one of the compartments that is not blocked by the tripod which would make these items easy to access without having to remove the tripod - which is nice. All materials are tough and strong. MindShift Gear backpacks don't appear cheap in any way and the Moose Peterson MP-3 V2.0 lives up to that standard. I'm impressed with the quality and the workmanship. I would expect this and other backpacks from MindShift Gear to last a lifetime! The Moose Peterson MP-3 V2.0 includes adjustable straps and padding that help to make it fit my body and distribute the weight. I have to say that the padding didn’t seem to be as thick and rigid as I’ve seen in other backpacks. This one seems to have been made for someone who isn’t carrying their gear very far and I say this because the thinner padding makes the pack feel less comfortable when loaded up. This isn’t a huge deal but considering the amount of gear the backpack holds, I would prefer for it to be more comfortable. Panels and pads are nice and thick where they need to be (yet still soft to the touch) with the big back panel that feeling nice and flat against my back. While I can't say that the Moose Peterson MP-3 V2.0 is small, it’s a very solid choice for a daypack and it packs very well. The pack is designed to conform with airline regulations as either carry-on or checked luggage (depending on the size) with the waist and shoulder straps tucking neatly out of the way. This pack (the MP-3 model) holds a lot of photo gear, the MP-1 holds even more (perhaps more gear than I'd ever want to hike with) and the MP-7 packs even smaller. For my needs, the MP-3 is the perfect fit but it’s nice to see one bigger and one smaller. No matter what your style of photography may be, I think the Moose Peterson MP-3 deserves a close look. With it’s innovative moose ear compartment door designed to stay closed and protect your gear from dust and moisture, this pack stands out from the crowd. I really liked the separate compartments that makes it easy to keep my gear organized. Add access to contents without having to remove the tripod and I find this backpack to have one of the more thoughtful designs I’ve seen. MindShift Gear and Think Tank Photo (a company started by the same founders) are known for having high quality products so it wasn't a surprise to see the Moose Peterson MP-3 V2.0 fit right in with that expectation. Both materials used and workmanship were very high and the result is a great backpack I'd expect to last for a lifetime. *Please notice that the overall score is lower mostly because it excels more with the short walks than the big hikes. If short walks are more your style, this could be an ideal pack. The positive side of this feature is that this pack would do really well traveling by airplane because of it’s ability to pack small with waist and shoulder straps tucked neatly away but the trade-off is a little less comfort on the longer hikes. As a day pack, I think the Moose Peterson is a very good choice - especially with the MP-1, MP-3, and MP-7 options. I was very pleased with how it met my needs. It holds all of the gear I would want and then some and because of this, it also works well as a trip pack where you take all the gear you think you'll need for a trip but pull out the big heavy lenses when you're hiking or know you won't need them. I really liked the combination of 3 separate compartments with the moose ear flaps. This is a really good design (with auto-closing flaps) that makes the backpack both unique and functional. My only concern is that the Moose Peterson line of backpacks is the waist and shoulder straps. Compared to other backpacks I’ve used, these felt thin and I don’t think the pack is as comfortable with weight on a bigger hike as some others because of this. 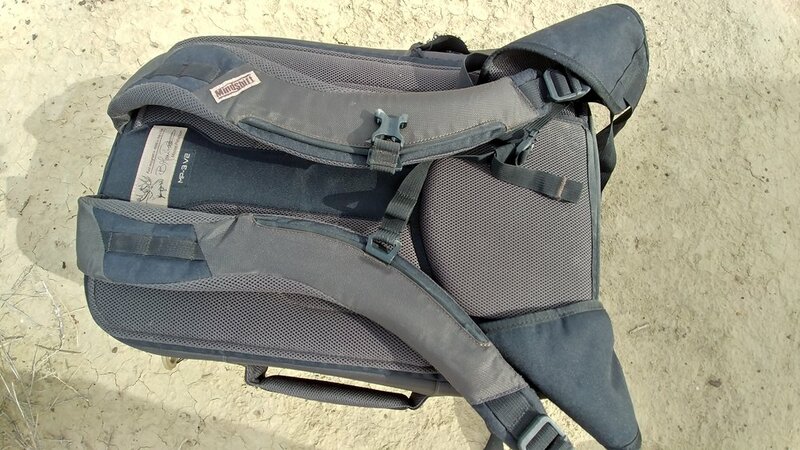 In fairness to Moose Peterson (the backpack designer), I believe this is because it helps the shoulder and waste straps to fold in neatly for travel - which is nice. So if you’re just looking for a pack to carry your gear for short distances, this is a great option. But for me, I generally prefer a pack that has thicker waist & shoulder straps. When we're looking at the differences between MindShift Gear's backpack lines, I find the Moose Peterson line to be different from the rest. With a unique design that features separate compartments and Moose Ear flaps, this isn’t like any of the other products offered by MindShift Gear. But that’s one of the things that gives it so much charm. Fortunately, it doesn’t end there in that what makes it unique also makes it shine! Thumbs up for the Moose! On all but the big hikes, this pack makes a great choice. Photographers will love the separate compartments and moose ear flaps!